The can jam round-up will be happening this weekend and I am guessing if I don’t have this recipe up by then I might have some cranky readers. So here it is. I don’t have a picture so it is way boring. Hopefully I will get a picture soon to break up the monotony of words, words, words. Finally had a pretty day so there are now pictuers. 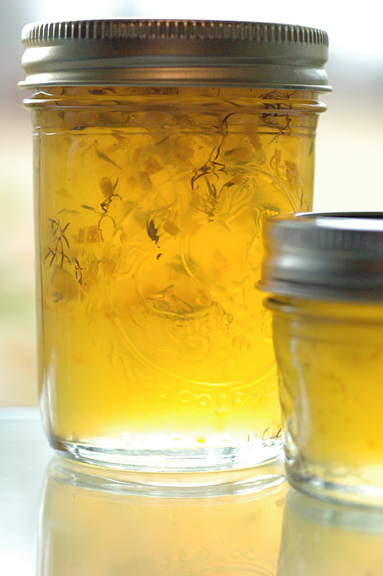 If you are looking for citrus I have two entries Orange Coriander Thyme Jelly and Meyer Lemon Kiwi Marmalade. While this has citrus – it isn’t the star. When I fell in love with the home we live in, it wasn’t just the house that wooed me. It was the whole property. Finding 1 1/2 acres within a 25 minute drive to Downtown Atlanta was quite the coup as far as I was concerned. But many things cinched the deal. One of these things was the absolutely enormous Fig tree in the back yard. And by enormous I mean well over 25 feet tall. My solution – a dehydrator. I picked the pendulous little guys on an almost daily basis, and every few days I would run them through my dehydrator. Once dried I packed them into freezer bags and put them in the freezer. 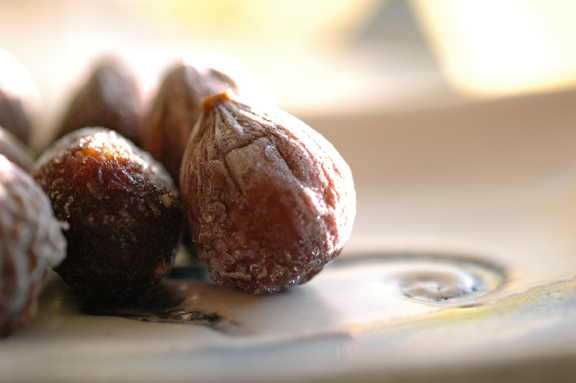 I figured I would find a recipe for dried fig preserves sometime in the future. This also had the benefit of allowing me to concentrate my canning efforts on the multitude of other produces that were demanding my time. Sin in haste, repent in leisure. I would can the figs during the canning “off season”. Little did I know that tigress would declare that 2010 would have no off-season. My grand total of dried figs was 4 quart bags stuffed to the gills. The first recipe I used was out of Small Batch Preserving (a fabulous book) and while very good, it was a bit too sugary for me. It used commercial pectin and a whole boat load of sugar – the result was a very tasty jam. But I wanted something better. I spent a goodly amount of time on the internet trying to find what I wanted, but couldn’t. I ended up taking a little bit from here a little bit from there and Frankensteining together my own recipe. It is not what one would call “traditional” but I think it is pretty good. 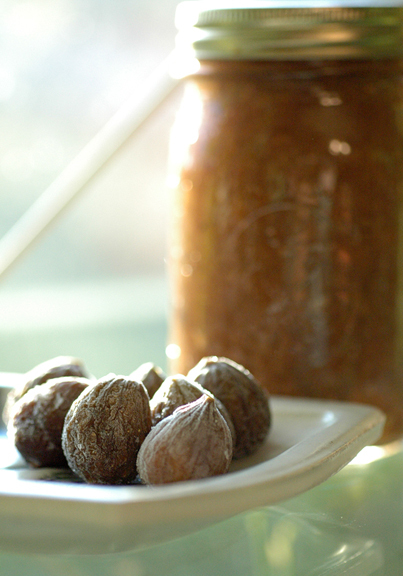 Dried Fig and Citrus Jam: this has been monkeyed around with enough that I cannot attribute to anyone but myself. This also means that it is totally not approved by the USDA – I expect to have the MIB at my door any day now. If you make this, store it, and then open it up and it has the funk please, please, please do not eat it. The Hardware: see The Canning Thing, you need enough jars for 4 1/2 pints, a knife if you are industrious a food processor if you are lazy like me. Peel and core apples then chunk up into the food processor, add figs and whir them up until they are finely chopped. Dump into a large cook pot. Cut citrus in half around the equator and juice into a liquid measure, remove seeds. Your goal here is a total of 2/3 C juice, if you don’t get that much you can round it out with bottled lemon juice. Scrape the pulpy stuff out of the inside of the orange and add to the pot, toss in the halves of the lemon whole – not the whole lemon because you cut it in half – but the whole halves. Does that make any sense? Cut the nubby tippy top ends off of the orange halves and discard. Then use a super sharp knife and slice the orange peel very thinly. I find it easiest to cut the cup shape in half so you can flatten it out and then do your slicing. Add the orange rind to the pot along with your water. Bring mixture to a gentle boil and keep it there for 10 minutes, stirring frequently. And by a gentle boil I do not mean a simmer, but also avoid a rolling boil. Get it good and going but don’t scorch it capice? Reduce heat and cook at a bare simmer for another 10 minutes. During the cooking, measure your sugar, salt and ginger into a bowl and have it at the ready. When the first 20 minutes of cooking is done, add the sugar mixture and stir in well. Simmer for an additional 20 – 25 minutes stirring occasionally (or obsessively – I cannot walk away from things because I live in mortal fear of burning stuff). Towards the end of the cooking you can start checking for jelling if you want to – use any method that works for you. I like the plate in the freezer method personally. When the cooking is done and you like the look of the jelling, fish out the lemon halves and throw them away. Stir in juices and remove from heat. Ladle into hot, clean jars and proceed with canning techniques. Remove air pockets, wipe rims, two part lidding, process leaving 1/4 inch head-space. Boiling water bath for 15 minutes if you are in the 1K – 2K altitude region or adjust for your distance from sea level. Going to Your DeKalb Farmer’s Market is an exercise in restraint regardless of how frequently I go. This time the piles of succulent citrus called to me from their bins, and I wanted to take them all home. Every kind of Orange, Tangerine, Lemon, Lime you can imagine (no Buddha hands tho) ripe for the picking. To narrow things down I decided on oranges, and further tightening the net I restricted myself to fruits from Florida. Among all of the Navels and Minnelos there was one lonely bin of Hamlins – and I decided to take them home. Not knowing ahead of time what I was going to make, I didn’t buy quite enough oranges so I had to flesh out the juice with some tangerines from my last YDFM foray. I really wanted to make an Orange Jelly, but all I kept finding was marmalade recipes. With some poking I was able to find a Spiced Orange Jelly recipe from the National Center for Home Food Preservation and I thought it would work as a base, even tho I really didn’t want to do the commercial pectin route – eh win some lose some. Hardware: canning stuff, see the ridiculously long page I wrote about The Canning Thing. Peel one of the oranges to get the zest and juice all fruit – remove seeds. Combine juice, zest, water and pectin with coriander that has been tied into a little bag. Stir constantly on high heat until you reach a full rolling boil. Add sugar and continue to stir. When you get back up to a full rolling boil that cannot be stirred down begin timing for one minute and then turn off heat. Continue to stir and remove spice bag, add in thyme leaves. Place one or two springs of thyme in each of your jars (that you have been keeping in your BWB) and fill to 1/4 head space. Do the whole jar wiping, lidding process as for any other canning. Process for time appropriate to your altitude – for me that is 10 minutes. Now the question is, other than toast – what shall I eat my concoction upon? I was weak and I didn’t just buy oranges, there were Meyer lemons and how does one say no to Meyer lemons? Those bad boys are currently soaking in the ‘fridge all sliced up and mangled, biding their time. So obviously there will be a Citrus can jam version 2.0 in the near future.